What is Wire Cutting / Wire Erosion ? EDM Wire Cutting or Wire Erosion uses a metallic wire to cut a programmed contour in a workpiece. Extrusion dies, blanking punches and various other forms of jigs and fixtures are often machined by wire cutting. Cutting is always through the entire workpiece. To start machining it is first necessary to drill a hole in the workpiece or start from the edge. 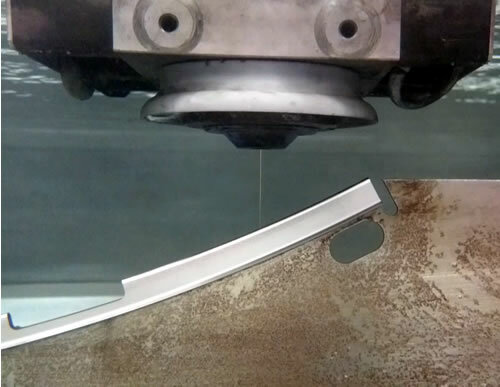 On the machining area, each discharge creates a crater in the workpiece and an impact on the tool. The wire can be inclined, thus making it possible to make parts with taper or with different profiles at the top and bottom. There is never any mechanical contact between the electrode and workpiece. The Wire Cutting / Wire Erosion process takes place quickly—hundreds of thousands of sparks per second—but the wire never touches the workpiece. The spark erosion occurs along the entire length of the wire adjacent to the workpiece, so the result is a part with an excellent surface finish and no burrs regardless of how large or small the cut. * Automatic wire threading allows for unmanned running of the machine. What is EDM fast hole drilling ? EDM fast hole drilling is an economic and efficient method of creating start holes for wire EDM operations. It is particularly useful when machining holes on curved or angled surfaces such as aerofoils, as the electrode does not exert any pressure on the surface. First of its kind to be installed anywhere in the UK ……. We employ a highly skilled workforce of precision engineers, EDM specialists with broad and extensive knowledge of the industry. As an ISO 9001 certified organisation we have implemented Quality Management System requirements for all areas of the our business. We take a positive approach to even the most complex customer requirements, working amongst the world’s most demanding engineering industries, our ‘Can Do’ attitude elevates us above the competition. With over 30 active EDM machines, and 24 hour a day production, we are able to provide timely delivery for all one job and high quantity requirements.